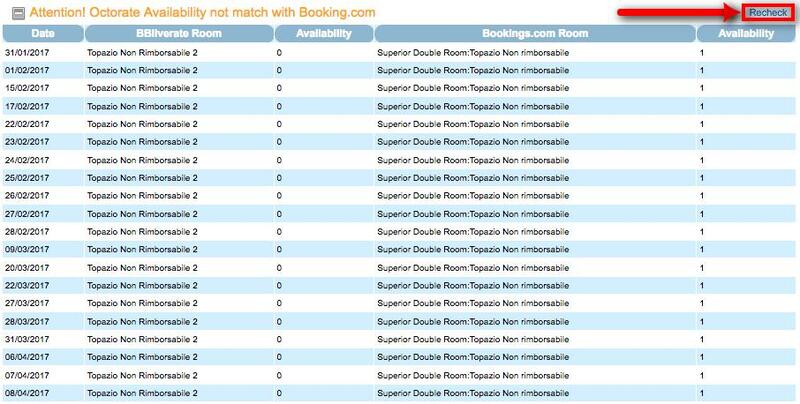 Error messages: "Octorate availability not match with..."
The Channel Manager indicates you an availability discrepancy between Octorate and OTAs? This is how you can fix it quickly! When you update your inventory from section CALENDAR, the system might ask you to align room availabilities. This happens because the system detected a discrepancy transmitting information from Octorate to OTAs. Select first and last date of the period involved in the discrepancy (Column A, Image 2 - in this example it's from 31 January to 8 April). Launch a sync and wait for it to finish the process. It may take a while, according to the lenght of the period. In the meantime you could also close this page. 3) As soon as the process is complete, click on "Recheck" to remove the error message (Image 5).